Let's Get Those Letters in Korean! Although language access for minorities is guaranteed by federal law, California's Department of Public Social Services (DPSS) is not complying properly with the law. The Community Health Promoters (CHP) of the Korean Resource Center (KRC), a group of Korean American senior activists, launched a campaign to pressure DPSS into compliance. CHP and KRC held a press conference on October 9th and pointed out that the Title VI of the Civil Rights Act was not being upheld in Medi-Cal letters. CHP and KRC plan to demand language services for minorities, including the Korean language, through campaigning. According to DPSS regulartions, documents must be released in a language if more than 3,000 Los Angeles County Medi-Cal beneficiaries file preference for that language. More than 17,076 have indicated preference so far for the Korean language, but no Medi-Cal letters in Korean have been issued. Title VI of the Civilr Rights Act of 1964 prohibits discrimination against minorities, and makes it mandatory for federally funded DPSS and hospitals to provide language assistance. Caroline Lee, Health Access Director at the Korean Resource Center, said "DPSS may think that Korean Americans are not troubled by the English-only letters, simply because not enough people have protested. They are mistaken." and indicated that "we are starting a petition drive along with other community organizations to make DPSS send Medi-Cal letters in Korean." 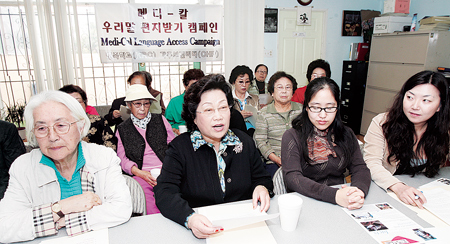 Korean American seniors are facing many difficulties because they keep receiving English-only Medi-Cal letters despite having asked for Korean language letters.